Chesapeake Grove - Delmarva Community Services, Inc.
"The support for the project we hear in the community and among agency partners encourages us everyday." This may seem like just a senior center - but it's not. After meeting Sister Edna Lonergan, President St. Ann’s Center in Wisconsin, during a field excursion to explore China’s various methods of serving senior citizens in the community, CEO/President Santo Grande was inspired to model the same opportunities here in the Mid-Shore region. 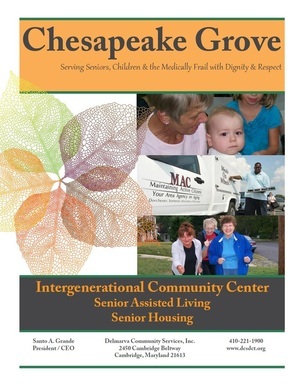 The Chesapeake Grove Intergenerational Center will bring several services under one roof, but in a space designed specifically to address the modern citizens expectations for community services and facilities. The space has been designed to be welcoming, encourage spontaneous interactions, convey a community-like feeling, create new opportunities for senior activities and interests, and to encourage a family atmosphere among its staff and visitors. The space will also include new possibilities for gardening, outdoor recreation, exercise, meditation, and therapeutic treatments. Expanding services to children is vital to the new center. Most importantly will be the genuine interactions to come between seniors, individuals with disabilities and children. The St. Ann’s Center has proven that this model works and how mutually therapeutic/beneficial this type of shared community space can be among the wider community when combined with programming. DCS is proud to announce that the Harry and Jeanette Weinberg Foundation will become a funding partner for the Intergenerational Center. The building will formally be named The Harry and Jeanette Weinberg Intergenerational Center. George B. Todd Fund, a fund established in memory of local businessman George Todd, seeks to support community projects through charitable giving and partnership. The Fund has challenged the community to donate/pledge $35,000 per year between Jan 2014 - Dec 2018 towards the Intergenerational Center which it will match. The new center will replace a failing ca. 1900s re-purposed canning factory that was renovated and given an addition in the late 1990s as the Cambridge Senior Center. Much has changed since then with the current building suffering from problems due to the overall design of the facility, physical degeneration of the structure, space restrictions, and changes to the needs of programming today. The new center will create an intimate, inviting community center that will be able to offer a variety of interesting and engaging opportunities. The new center will also give stakeholders more choices in programs, services, clubs, and classes made available in small group settings. Evening & weekend access will be available to community residents and facility rental will also be possible. 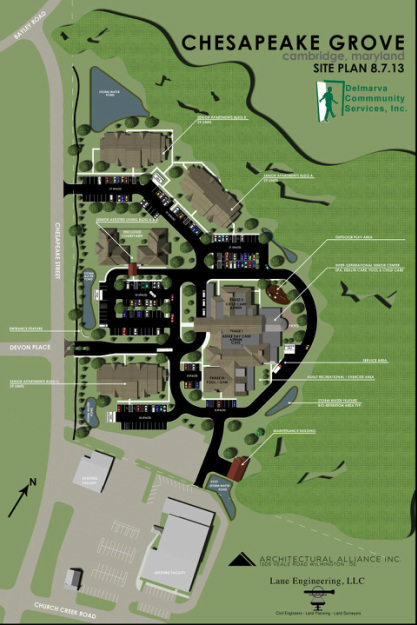 DCS plans to build three (3) Senior Housing buildings containing one and two bedroom units. Each senior housing building will contain approximately 29 units in each building, with units featuring kitchens and washers/dryers in each unit. The units will provide residents immediate access to the services and facilities within the intergenerational center. Residents will also have easy access to the Delmarva Community Transit network. Dorchester County currently has NO FORMAL assisted living facilities. DCS anticipates helping to fill this need by building two separate buildings, each contributing 15 beds for area seniors needing a higher level of assistance but not requiring nursing home care. DCS also anticipates providing support for couples where one partner may live in a senior housing unit while another resides in a assisted living unit. DCS anticipates providing a stepped down or continuum of services including in-home assistance. Interactive programming between daily attendees of the center including adults, individuals with disabilities and children. Activities coordinated with school children from two elementary schools, one middle school, and one high school all located within 1 mile of the center. Natural spontaneous interactions between attendees fostered by unique physical spaces in the center. DCS cooperates with area agencies to provide information and assistance to Eastern Shore seniors.